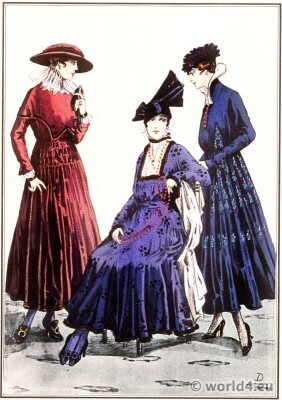 Modèles du Style Parisien Robes de Soie – Silk dresses 1915. Dress in cleared colored Britannia; handsome and rafter stiff corded silk (Bianchini No. 20770). Bodice shaped like a large collar; collar bordered with black velvet. White tule collerette. Skirt gathered and trimmed with two black velvet ribbon round the border. Dress in worked Sueza: a corded silk brooch with satin spots (Bianchini No. 19023). Guimpe of piped tulle. Lower part of skirt and bodice trimmed with skunk. Smocking under yoke. Dress in navy blue taffetas trimmed with ” taffetas latte ” embroidered (Bianchini No. 19012). Collar lined with ivory faille. Gallery: Le style parisien. Plate V. Supplément du ” Style Parisian ” No 3. Le Directeur – Gérant: Lucien Vogel. *Bianchini-Férier is a silk manufactory founded in 1888 in Lyon by the association of the creator Charles Bianchini, technician François Atuyer and financial François Férier. In 1912 it moved to the Avenue de l’Opéra in Paris and worked with all the major fashion houses of haute couture together as Worth Poiret, Doucet, Vionnet, Lanvin, Patou, Carven, Paco Rabanne, Nina Ricci, Chanel, Dior, Yves Saint Laurent, Christian Lacroix, Jean Paul Gaultier, Hussein Chalayan, Dries Van Noten. On the other hand, Charles Bianchini promotes collaborations with artists. The longest of these collaborations is certainly that of Raoul Dufy (formerly with Paul Poiret), which signed an exclusive contract with the house of the Lyon silk and is the designer and artistic director from 1912 to 1928. He imagines a particular logo representing the metamorphosis of a caterpillar into a butterfly in the petals of a flower to symbolize the link between the company and silk. “The ornamentation in the tissue is an additional thing to life; as a small illustration can play its role with discretion in relation to its physical fragility. “. His compositions are dedicated to Pegasus, the Procession of Orpheus, the Dance. Other artists who have collaborated with Bianchini-Férier: Georges Barbier, Paul Iribe, Yoni Beaugourdon, Sonia Delaunay, Leleu, Robert Bonfils, Henri Gillet, Paul Mansouroff, Jacques-Henri Lartigue, or later Vasarely, Kientz, Daniel Buren. High Class Hat Models. Art deco fashion 1921. Création de Couturier Lucile Paray. Art deco fashion 1933. Model of “Rolls-Royce” by Jean Patou, Paris 1929. 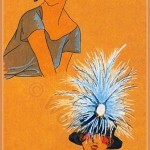 1929 • 20s • Art Deco Period • France • Haute couture • Headdresses • Les Creations Parisiennes. Model of Séduction Altière. French hat fashion 1921. Orchids. Short jacket from Gerstel. AT THE LAKE. Spring hats from Conrad. Art deco fashion 1922. Maria Orska applying makeup. Art deco fashion 1922. 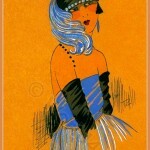 This entry was posted in 10s, 1915, 20th Century, Art Deco Period, Fin de siècle, France, Le Style Parisien and tagged Art Deco Fashion, Belle Epoque Fashion, Lucien Vogel on 8/6/14 by world4.